»afropunk»AfroPunk Fest Lands in Brooklyn! For over 10 years, the AfroPunk Festival has united music fans from all ages, genders, political beliefs and orientations–all for the love of music! The 2-day weekend fest included concerts, an AfroPunk ball and parties in Manhattan and Brooklyn from August 21-23, 2015. The annual music festival began in 2005 at the Brooklyn Academy of Music (BAM) and continued to grow with the festival organizers since 2008, Matthew Morgan and Jocelyn Cooper. Excitement about the festival has attracted legendary talent over the years like D’Angelo, Lianne La Havas and Meshelle Ndegeocello. This year, they raised the bar of talent with Ms. Lauryn Hill, Grace Jones, Suicidal Tendencies, Thundercat, Vintage Trouble, Gary Clark, Jr and the legendary rock god and event headliner, Lenny Kravitz! AfroPunk is a great community event, because people express their truth. During the week, “AfroPunkers” may work a corporate 9-to-5 or come from a community that does not support their uniqueness. They can let their afros, dreads, weaves and perms flow freely among other like-minded artists, musicians and activists at the AfroPunk Fest. They are not judged for piercings, tattoos and hair-color inspired by the rainbow; instead, they are celebrated. The musicians who performed felt the mutual respect fans had for one another and it encouraged the musicians to give the fans a show they will never forget. On Saturday, Ms. Lauryn Hill performed despite sound equipment issues and a disgruntled audience. Grace Jones closed out the night with a hot performance displaying her body-painted physique, while doing the hula hoop to Jamaican drumbeats! On Sunday, Thundercat showcased why he is a favorite bass player among singers like Erykah Badu and Kendrick Lamar. Later, Gary Clark, Jr. blazed the stage with songs from his current cd, “Blak and Blu,” including When My Train Pulls In, Bright Lights and Numb. 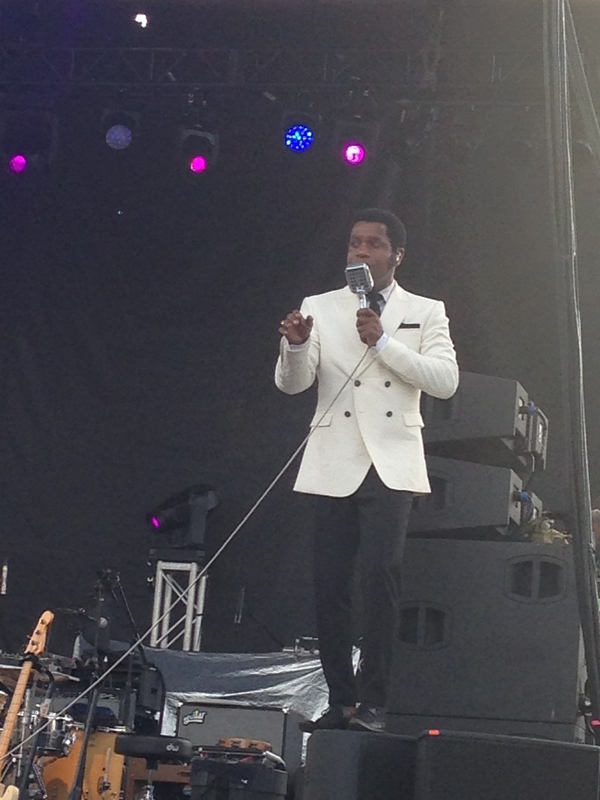 He also performed new tracks from his upcoming cd release, “The Story of Sonny Boy Slim.” It was a cool mellow vibe at the Green Stage until the group, Vintage Trouble burst on the scene with lead singer asking, “Are you ready to party? Get up off your blanket!” Vintage Trouble has appeared on ABC’s talk show, The View, but those at AfroPunk who were unfamiliar had no idea about the ride they would take that night. 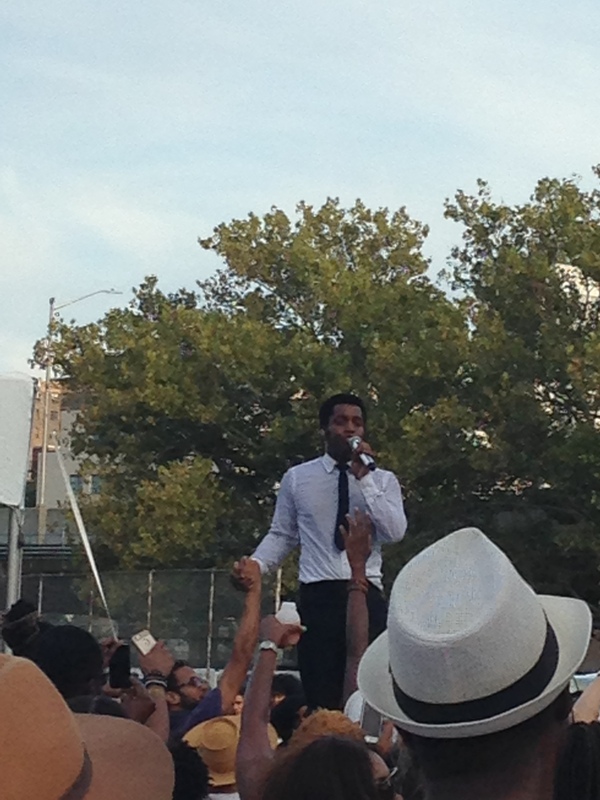 Vintage Trouble ended the performance with the lead singer, Ty, going out into the crowd for the song, Run, Baby, Run. 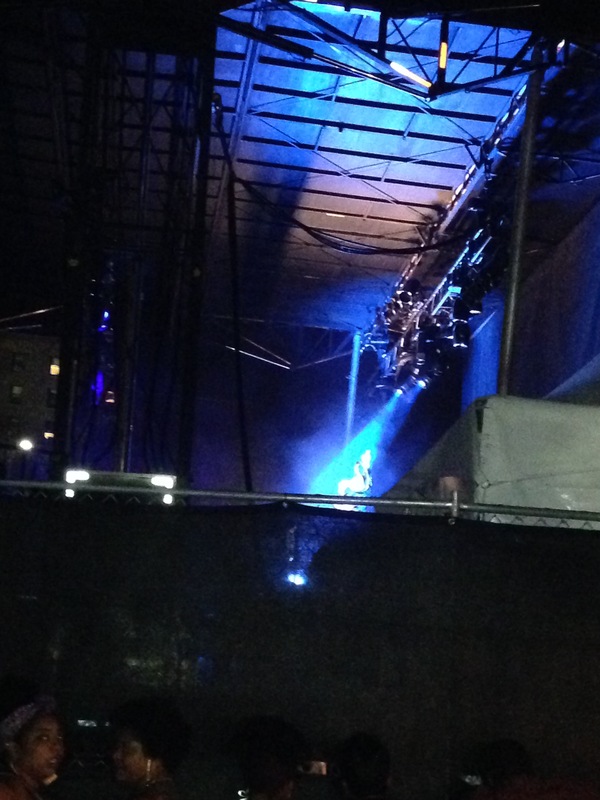 The energizing performance completely changed the tone and made the crowd even hungrier for Lenny Kravitz’s performance. 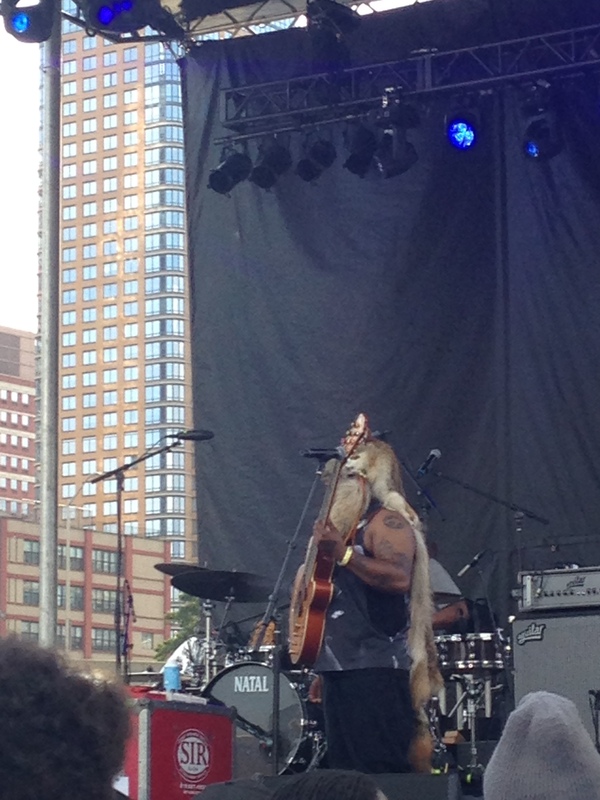 Lenny Kravitz came out on stage with a beard and sunglasses and the rocker uniform, leather pants. He sang all the fan favorites like, It Ain’t Over ‘Til Its Over, Believe, I Belong to You, Always on the Run and Let Love Rule. Just when the crowd thought the performance was over, Lenny came back to perform a super-hyped, fist-pumping performance of Are You Gonna Go My Way? It was great to see expert musicianship of drummer, Cindy Blackman-Santana and lead guitarist, Craig Ross, who have worked alongside Lenny Kravitz for many years to elevate the sound and lyrics of the music. Lenny’s background singers emphasized the funk, soul, rock and hip-hop of his songs with their singing and dance moves. 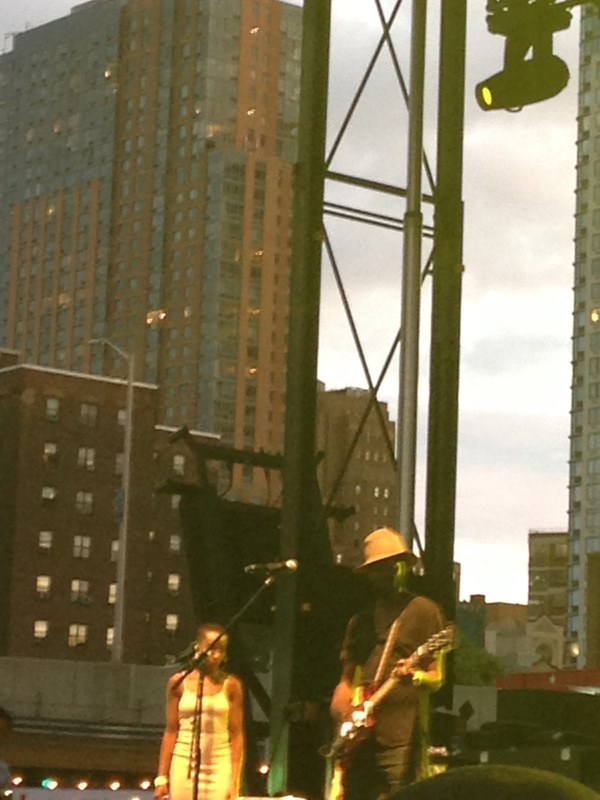 Lenny Kravitz is one of my favorite singers, but it was my first time seeing him (Cray, right?) I’m still floating from the experience. Even the most thugged-out guys in the crowd were shrieking like teen girls at a One Direction concert. In addition to groundbreaking performances, the AfroPunk Fest had various vendors that sold clothing, hair products, jewelry and hair accessories. Local Brooklyn and New York City eats were provided by Hill Country BBQ, Madiba, Carl’s Steaks and more. Since AfroPunk attracts activists, the festival included the Activist Row to highlight organizations such as Hip Hop Saves Lives, Black Lives Matter and Habitat for Humanity. In fact, people were able to receive free AfroPunk tickets in exchange for participation in the AfroPunk Army. Member of the Afro Punk Army volunteered at a New York City non-profit. I earned tickets by volunteering with Habitat for Humanity. It’s a great way to give back to the community and see some unbelievable music performances. This was my first AfroPunk Fest and it will not be my last. ← Watch a Living Music Icon, Prince on SNL 2nite!